Thomas Bjorn speaking at this afternoon's press conference in Paris. 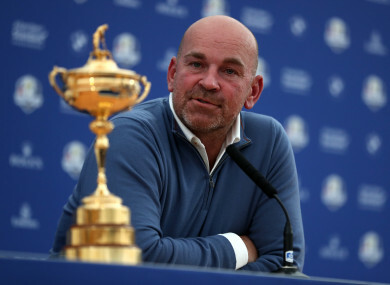 EUROPE CAPTAIN THOMAS Bjorn said his team “don’t fear anyone” as they prepare to take on a powerful United States line-up packed with nine major champions including a resurgent Tiger Woods at this week’s Ryder Cup. France’s Le Golf National, just south of Paris, is only the second European venue outside of Britain and Ireland to stage the biennial showdown in which the United States will be targeting a first win on foreign soil since 1993. The Americans are bidding to retain the trophy after a 17-11 rout at Hazeltine two years ago, and bring over a squad that has combined for 31 Major titles — compared to just eight for Europe. “These are 24 of the best players in the world, and you know, when they go up against each other, they are all capable of amazing things on both sides,” Bjorn told reporters at a joint press conference with US counterpart Jim Furyk on Monday. “We don’t fear anyone because we’ve played against them so many times before individually but we respect our opponents and know what we are up against. That I think is the key to all this. The star attraction in France will undoubtedly be Woods, who is making his first Ryder Cup appearance since 2012 following a long road back from injury that threatened to curtail his career. Woods won the Tour Championship on Sunday at East Lake for his 80th career US PGA Tour title, two shy of Sam Snead’s all-time record, and his first victory in 1,876 days. “I spent 25 years playing professional golf with Tiger Woods on the scene, and any time he does anything great, that’s a story and that’s where we want to see him,” said Bjorn. Fans chanted “Ti-ger, Ti-ger” and “U-S-A, U-S-A” amid a spectator stampede surrounding Woods in a rush to see him on the 18th green, with the 42-year-old fighting back tears before his clinching putt. “I think you could see the emotion in talking about fighting back tears. I think the arms in the air and the fist in the air, it was important for him to win,” Furyk said of Woods. “When you look at now, maybe comparing past Ryder Cups to this one, I think what’s so special is Tiger has engrained himself in our team atmosphere and became such a big part of the team in 2016 as a vice captain, and then again in 2017 as an assistant captain at the Presidents Cup. Furyk says Woods’ presence will simply add another level of anticipation to an event that is expected to welcome more than 270,000 fans through the turnstiles. “It obviously brings — not that this event needs much more energy or that brought to it; it’s probably the biggest, the grandest event in all of golf but it will add that much more excitement, I believe, and you know, it’s exciting either way, but it adds to it,” he said. Email “Europe don't fear anyone as they bid to regain Ryder Cup, says captain Bjorn ”. Feedback on “Europe don't fear anyone as they bid to regain Ryder Cup, says captain Bjorn ”.